I’ve been obsessed with the history and politics of Cuba for 7 years now and will read any and all things I can get my hands on, if they pertain to Cuba. 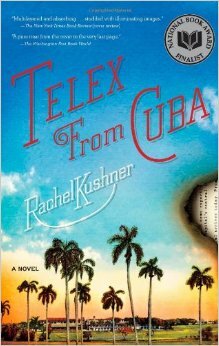 Telex From Cuba is a novel written by Rachel Kushner that tells the story of numerous families affected by Fidel Castro’s revolution, the 26th of July Movement. We have plant managers of United Fruit, an American sugar producing company that had a huge presence in Cuba until the late ’50s. We have the children of said managers, some of whom are sympathetic to the interests of American companies in Cuba, some of whom sympathize with the Cuban people, and one of whom even joins the rebels in the Sierra Maestro to fight for the overthrow of Batista. We have the stories of the Cuban people, some of whom are poor every-day-Joes, some of whom are politicos making back-door deals with the American government. I’m kind of conflicted about this book and glad that I’m not doing any numerical ratings this time around, because I really don’t know what I’d rate it. On the plus side, of all the novels I’ve read about Cuba, and specifically Castro’s Revolution, this is probably the best at showing all sides. Typically, they are either pro-Castro or anti-Castro and don’t bother to explain the complexities of the situation. In this instance, I think readers were treated to a pretty fair analysis of how the Cuban people were being taken advantage of by the interests of American countries, and how Castro’s Revolution disrupted the lives of many. So, I’d say that the story was spot on and successful. The writing, on the other hand, left much to be desired for me. There were, I don’t know, at least two dozen characters we were supposed to keep track of. Like I said, I liked that so many points of view were represented, but at a point it just became tedious. Some of the characters were there to make the same point as others and I would have preferred a little more focus. As it was, I had a hard time remembering who some of the people were, with which side their sympathies lay and what their backstory was. If this book had not been about Cuba, I would absolutely not have liked it. However, it was one of the most well-rounded novels I’ve read on the subject. This entry was posted in book reviews and tagged book review, fiction, kushner. Bookmark the permalink.